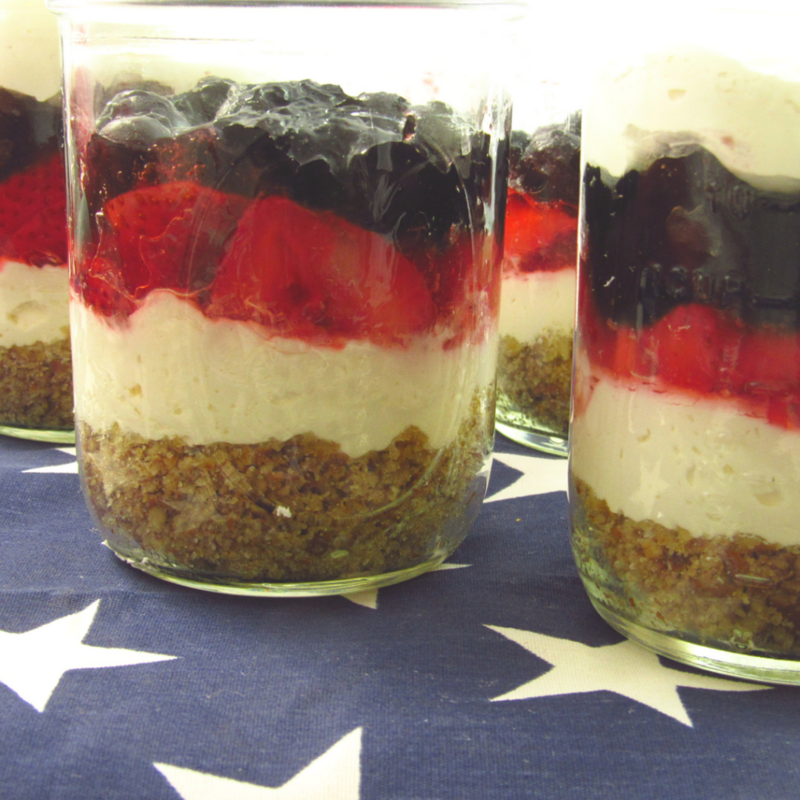 This Patriotic Pretzel Salad is a perfect summer dessert with fresh strawberries and blueberries in refreshing jello, a creamy cheesecake filling, and a salty, sweet pretzel crust. Best off all, it’s sugar free!!! Why this is called a salad I will never understand? But if we’re calling dessert, salad now, I’m down with it. Admittedly, jello is not my favorite dessert. But I was always drooling over Strawberry Pretzel Salad recipes, and why wouldn’t I? Strawberries, Cream Cheese, and salty sweet crust… it sounded delicious! I wanted to make a special Memorial Day treat for us, and I decided it was finally time to try try this summery dessert. But given that it was Memorial Day, I wanted this pretzel salad to show my thanks to our American soldiers and be a little more… American. I thought a layers of Georgia Blueberries would be just the American addition I needed. Not being an avid jello eater, I was clearly uneducated about enormous selection of jello that is available. However, there was not one sugar free blue colored jello – I even went to two different stores! Really? Every other color exists… except for blue. Luckily I had some food coloring and just made it work. I actually think it turned out better this way. The blue jellos that were available were not a color often seen in nature. 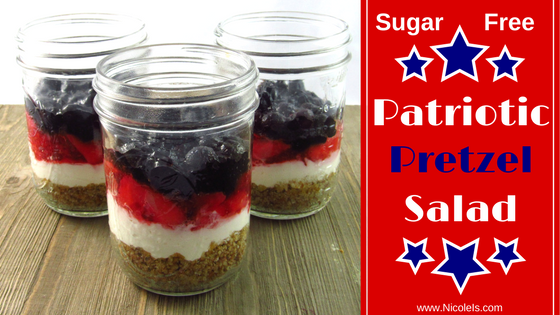 This Sugar Free Patriotic Pretzel Salad, came together far faster than I thought it would and it turned out just adorable! And coming from a non-jello eater – this was delicious and refreshing! The fresh ripe fruit really popped in the sweet jello. The combination with the creamy cheesecake filling and salty, buttery pretzel crust hits every taste bud for zing-zing-zing! Plus it was a Memorial Day show stopper! I think I’ll be making these for Fourth of July as well!! Bring water to a boil. In one bowl, stir together 1 1/2 cups of water and raspberry jello. Stir in blueberries. Add food coloring until the color matches the blueberries. In a separate bowl, stir together the remaining water, strawberry jello, and strawberries. Refrigerate jellos until almost set, about 45 minutes - 1 hour. In a food processor, whirl together the pretzels and Splenda until the pretzels are in very small chunks. Add the melted butter, and whirl it up until it has a moist crumb. It's okay if the crumb is inconsistent, the little crispy chunks are a nice crunch. In a 9 x 13 pan, evenly distribute the crust and press it firmly down. 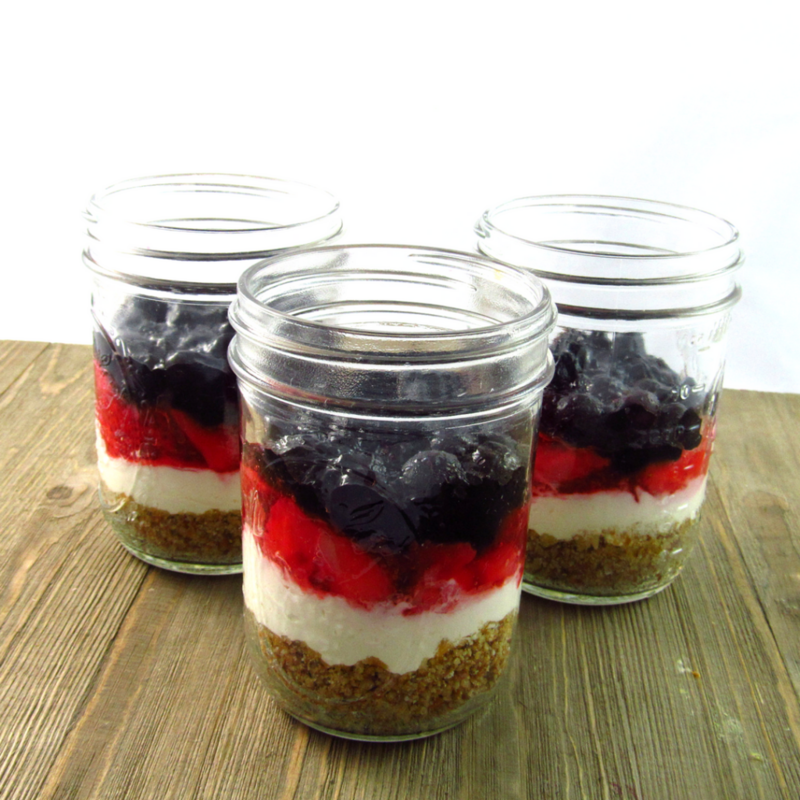 If using Mason jars, evenly distribute crust and press firmly down. On medium speed, blend together cream cheese, cool whip, vanilla, and sugar, until well combined and delicious! Layer the cheesecake filling over the pretzel crumb. Add an even layer of strawberries and then the blueberries. Cover and chill until fully set, about 1 hour. Top with more cool whip and enjoy!! This keeps very well! It can be made 2 days in advance. Refrigerate jellos until almost set, about 45 minutes – 1 hour. In a food processor, whirl together the pretzels and Splenda until the pretzels are in very small chunks. Add the melted butter, and whirl it up until it has a moist crumb. It’s okay if the crumb is inconsistent, the little crispy chunks are a nice crunch. I love the sound of that pretzel crust! This seems a lot healthier than the desserts I am so used to eating. Perfect for Summer! Nice idea ! Although I would eat it all year long this pretzel cup! Looking delicious! You could definitely eat it all year. I think next time I may try some different fruits, like mango! I have never had a pretzel salad, but it sure does sound interesting. Perfect to take along and celebrate with too. I hadn’t either. But they’re really popular in the South – go figure. It was really good! This looks super delicious! 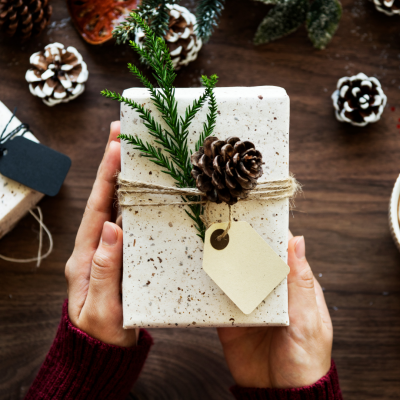 I love how you used the colours to make them perfect for the holidays! Thank you so much! I don’t use food coloring often, so I was glad that it matched! This looks so yummy! And I love how it shows the colors. This would be so much fun to make for a backyard party or BBQ! Thanks for sharing. 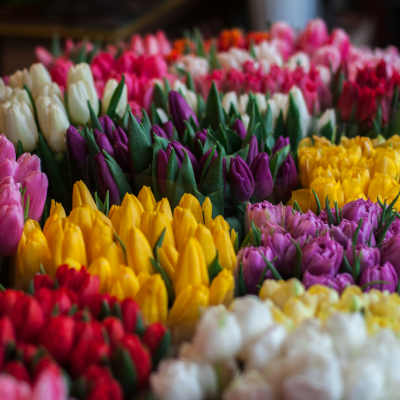 This looks so appealing …love the colours….. Totally with you, I wouldn’t call it a salad either, but it does look a really healthy, attractive and delicious dessert! This looks so good for the 4th!! YUM! Wow, this is such an amazing recipe! I love the theme and colours and the fact that it’s healthy is a huge bonus! My mom makes something very similar – I love it! These look so festive for the holiday. Reminds me of the jello parfaits my mom made when I was a kid. Using the raspberry jello and coloring it is clever! 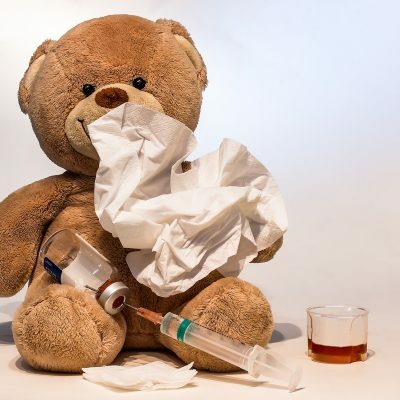 (And no – I don’t want that bright blue jello! LOL) I like the creamy/fruity/crunchy contrast, too. This recipe looks super delicious. Something that I can always have in this sweltering heat. 🙂 Thanks for sharing. These are adorable! I love dessert jars! Those look perfect for July 4th! Definitely a crowd please and something fun to make with the kids! What a great spin on a vintage dessert. Sugar free options are important to a lot of people. Love your patriotic theme. What a cute idea. I love salty/sweet desserts. 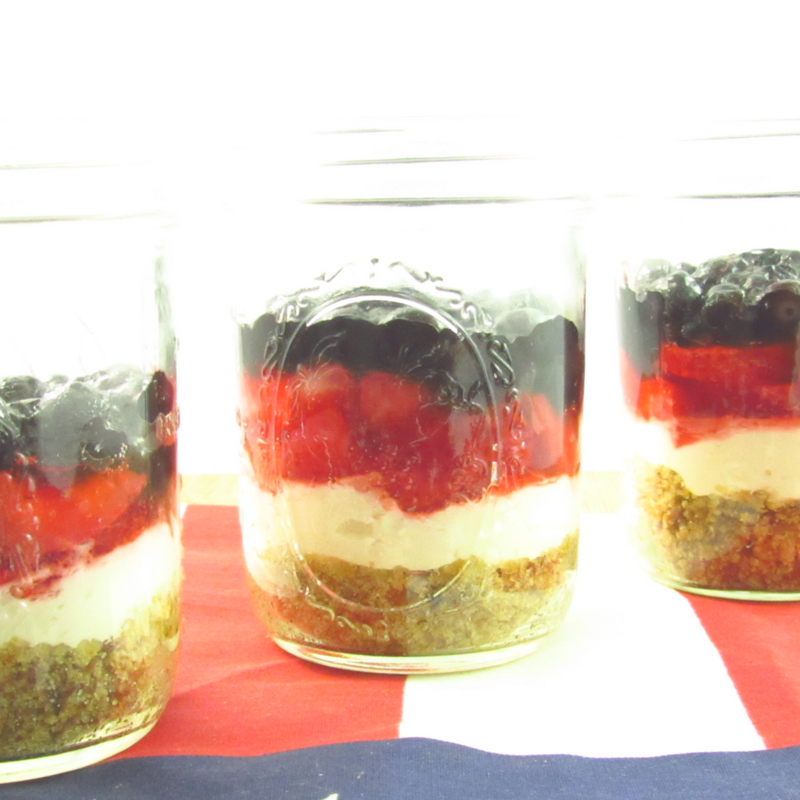 This sounds delicious and looks so patriotic, I love it layered in those ball jars! Pinning for later 🙂 Thank you for joining us at Create and Celebrate! 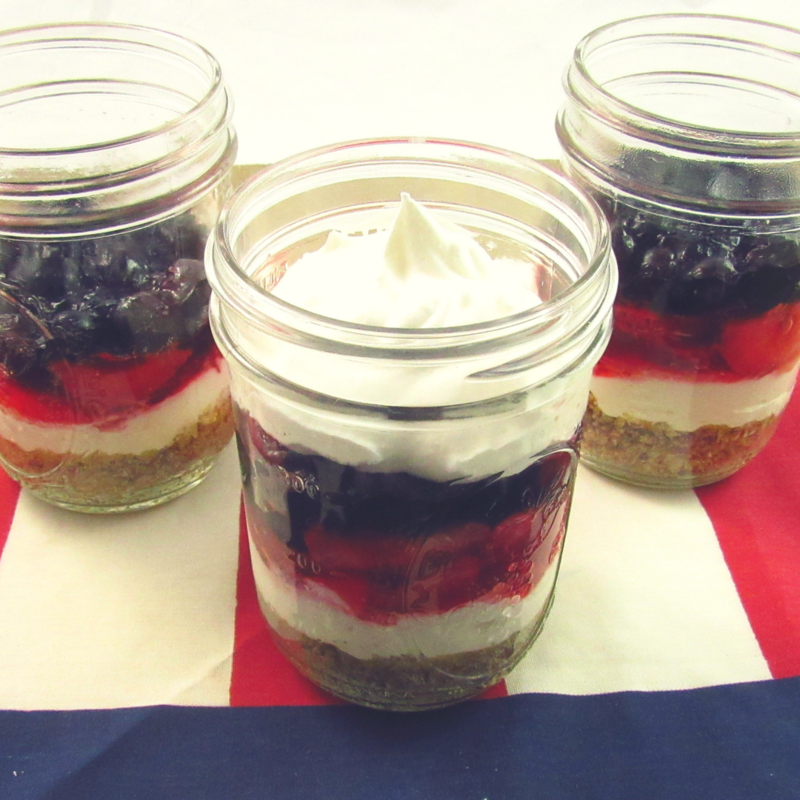 These are so fun for July 4tth!! The kids would love these so much! !